Lest you think I was being a complete slacker, I was watching a video course on HTML, and spent part of the time doing the exercises for the course. I may have also watched an episode of Sanctuary at some point. It was, frankly, a pretty awesome day, and I’m a pretty lucky girl to have a family that is self-sufficient enough that I can actually have a day like today. 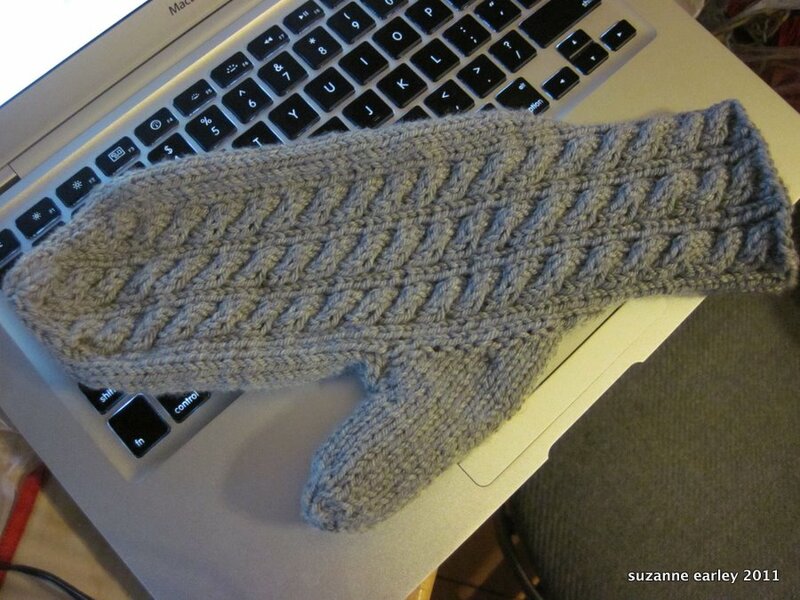 I was even more of a slacker yesterday, and while I started the mitten, I only got as far as the cuff. I couldn’t really tell you what else I did — oh wait! I cleaned the kitchen! And freaked Mark out when I told him I had an IDEA for the kitchen. He got one of those “Oh crap, how much is this going to cost me” kind of a looks, but luckily for him, it’s more a labor thing, than a spend a lot of money thing. It’s a cosmetic change, and in the morning, when it’s lighter, I’ll take some before pictures so you can see what it is I want changed. Not that it will happen any time soon, as we’ll hit the ground running for another busy week, and we should probably do the kitchen remodeling that my Mom’s kitchen needs before we touch our own kitchen. We also went to Marshalltown to hang out with some friends, and that pretty much killed the whole evening (and I use “killed” in the positive sense, in that we had an awesome time, and wish we did that kind of thing more often). And now, since I had such a busy day, I should probably head to bed. You know, since it’s been so long since I’ve seen my bed. **Dinner = lunch. The popcorn was our supper.